Is Branson Suffering From a Lack of Debauchery? A record 17 theaters will be open on the off season this year. Silver Dollar City and the Dixie Stampede will be open through the Weekend and the last signs of significant traffic on the strip make way for long unemployment lines. Branson's tourist season extends every year. Tourists hoping to beat the crowds trickle in for some hot winter fun. A large number of people have arrived at this post looking for work in the Branson area. If you need employment you can visit the site below. If it weren't for agent technology I might've missed this one. A custom "Branson Awareness API" helped me grab this one off radar. Details magazine wrote an article about Branson - and wow - the article is so fascinating I'm dedicating an ariticle in the January 2006 issue of the Branson EDGE to explore it....Currently, the Branson EDGE is being redesigned for what looks like a promising year. Alright, so Branson came up on radar but the website shared with GQ had no mention of the aritle. I searched hi and lo - near and far - the details of the Detail's article couldn't be found anywhere. After searching through dozens of stores I finally found a copy. The 6 page article "Will Branson ever be Cool? ", sits in the back of the December 2005 issue. The juicy Details article backs up some of the statements made early this year in the Branson EDGE article "What is Branson?" Is Forsyth, Missouri about to put poison in the water? Alderwoman Cheryl Altis stood as the sole voice against putting fluoride into the city water system. Concerns voiced by citizens were not loud enough to justify a ballot item over the issue - so says the Forsyth city council. At one point the city purchased a bucket of fluoride and debated over which council member was going to dump the bucket of fluoride into the city's water system. Apparently, concerns over putting fluoride into the water system were not enough to stop support of adding fluoride but too much to bank a political career on supporting it. Several cities and Western countries have banned the use of fluoride over health concerns claiming fluoride is a toxic industrial byproduct. The city has decided not to put the issue on the ballot. When it comes to toxins one rule should apply. "If in doubt, keep it out." 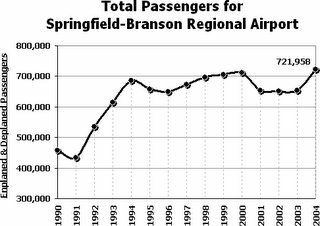 It's official the Springfield-Branson Regional Airport is no longer. Offering nearly a dozen major US destinations our airport is now officially national. Earlier this month, a new logo and tagline for Table Rock lake was unvieled. The design and logo was created with help by "The Team" in Ozark. The design was created to express the welcoming nature of the community. I just wanted to post this map from the chamber. It's a map to the area Christmas Lights! I've been thinking a lot about the sign above. 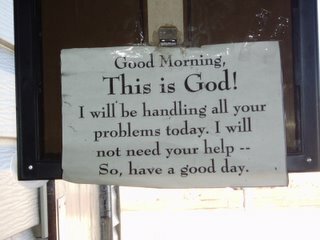 It's from a small cafe called Mary's in Groom,Texas. The owner is on a mission for God. His restaurant served some of the best food I had on my months long excursion across the US. Perhaps, best of all, the meal is free. "It's on God." Before I was given the chance to properly chronicle this adventure I came across a post by "The Old Seagull". The article continues to point out that most of Wal-Mart's shopper's are Christian. Seagull, wasn't happy about taking Christ out of Christmas. In the article he even comes up with a solution - slip "Merry Christmas" cards to the Walmart employees in Branson - to remind them the "reason for the season". Personally, I'm not sure I want the official "religion" of Wal-Mart to be Christianity. I'd bet they sell a lot more Santa Claus than manger wrapper. They use to sell American made products. Remember when that was their motto? Today, it's almost seems difficult to find American made products among the rows of garments made from overseas sweatshops and Chinese made electronics. Not to mention - supporting a family on a Wal Mart employee wage falls far short of the glamorous life and not too far from poverty. Let me give this to Wal-Mart - they make an effort to give back to the community = allocating a percentage of locally gained revenue to local charities. During the aftermath of the hurricane, they sent massive amounts of resources - including some local soldiers to fight the madness that ensued in the storm's wake. Still, the employees, stockholders and success, measured in mammon, far outweighs loyalty to any religion when it comes to business decisions. I think readers in other parts of the country may find the ideas of the Ole Seagull radical. For where you live - they probably are. They aren't here and that's one of the things that makes this place special. The parade in Branson focused on bringing Christ back into Christmas is something very unique. The fact that it was corporate advertiser free is an example Branson has set - not our nation's cultural norm. The largest corporate interest in Branson is Silver Dollar City. The family that owns the Theme park also owns two of the top ten charities in the region. They are a faith focused organization and their charitable contributions reflect this. Again - far from the corporate norm. The free burger from God cooked through proxy in Groom Texas is one of the best I've every eaten. The 12 apostle themed tables - the sermon over lunch and the stones throw to the largest cross in the Western Hemisphere - gives heed to the owner's claim that he's sponsored by God. I can say with certainty that the Fortune 1000 are all companies focused on financial prosperity = mammon. I'm not sure I want or need them to boast official affiliation with my God. The widening to four lanes of U.S. 65 south of Hollister, starting in 2006, will conclude a long but steady effort to add lanes along the increasingly busy corridor between Springfield and the Missouri-Arkansas line. Currently, U.S. 65 is being four-laned through Hollister, with an interchange and overpass also being built. This $19 million project was made possible through a partnership involving MoDOT, Hollister and Taney County. This project is scheduled for completion in fall 2006. Next up, in late 2005, work will begin on a $10-million project to four-lane U.S. 65 between Branson and Hollister. A second bridge carrying the two new lanes will be built over Lake Taneycomo. The Hollister-to-Arkansas project, estimated to cost $36 million, involves four-laning eight miles of U.S. 65. Amendment 3 funds have accelerated the Branson-to-Hollister project. Amendment 3 also enabled MoDOT to add the Hollister-to-Arkansas project to the 5-Year Plan of construction work. The project in April 2005 was voted the highest-priority rural highway need in Missouri by a statewide Major Projects Task Force of city, county and state transportation officials. For more information, contact our Springfield District Office at 417-895-7600 or 1-888-ASK-MoDOT (275-6636). Branson Missouri - Are we in Branson yet ? Can you give me a sign? An article this morning in the Baxter Review brings up a good question many travelers to Branson Missouri may ask. Are we there yet? The article chronicles a common experience travelers may have on the way to America's most popular family destination. We'd see the billboards with Andy Williams and Petula Clark and Glen Campbell and Yakov Smirnoff and Ray Stevens and get all het up about seeing these old faves. Only suddenly, after the Arkansas-Missouri border, the billboards would vanish. In their place would be the usual highway signs about how many more miles it was to Springfield, Mo., and its amenities. But there wouldn't be another word about Branson. Unlike other cities in Missouri - well across the United States - Branson doesn't have a "Welcome To Branson Missouri" sign. Perhaps, something this simple would end the type of confusion apparently our neighbors feel. How much more confusion do our millions of tourists feel? The tourist season in Branson is coming to a close. A large percentage of the population will be unemployed. This town vibrant and busy with tourists will become somewhat of a ghost town. Those lucky enough to find year round employment - or at least a great majority will be planning for the 2006 season. As an interactive media buyer I spend a lot of time monitoring the media buys of competitors in the Branson Market. Unlike the standard cost per impression charges in traditional media, most interactive media is purchased on a "cost per action" basis. Generally, business's in the area try to ride the interest of travelers seeking information about the area. This segment - those actively searching for travel information about Branson represents a small group of people. Through their behavior we can tell that they already have an interest in Branson. National and local companies bid for the attention span of this small group of consumers. National and local competition can become fierce at peak times as they fight for the attention of consumers to the Branson market. The Chamber of Commerce and Tourism Board in Branson are the same entity. Their goal is to increase tourism. They are supported by both our tax dollars and private membership fees. Though some see this as a conflict of interest - having a unified entity is important as our city's budget is relatively small compared to the spending capacity of competing cities. The problem - last year the Chamber started some aggressive advertising online. Some of the budget was put into online bidding systems. Though this is an easy method of gaining traffic is does very little to bring in new customers. In fact, these customers are already coming. When the Branson Chamber of Commerce bids on the attention of people already coming to Branson they bid against the entrepreneurial efforts of active online advertisers. This type of marketing drives the costs of Branson business's up and fails to bring in new visitors. I hope this year the Chamber has the courage and fortitude to aggressively seek new visitors to Branson instead of making local entities pay more for the advertising they're already buying. There are a lot of ways to increase tourism to our city online. A lot of research has been conducted to understand the geodemographics of our customer base. Gaining new visitors means focusing on lucrative regions and keeping the frequency of contact with these markets in a timely manner - as we do with our traditional marketing. Funds used to bid against Branson companies that are trying to gain sales through visitors already expressing interest in Branson comes at a cost of aquiring new ones. Branson's 57th Adoration Parade - "The True Spirit of Christmas"
The 57th Adoration Parade is designed to celebrate the true spirit of Christmas. Unlike other "holiday" parades. The Adoration Parade celebrates Christmas with a commercial free format. Thousands gathered the weekend to hear local talent celebrate the holidays by "Keeping "Christ in Christmas". For the locals, this is a bitter sweet time of year. The Branson market is buzzing with busy shoppers, tour busses and crowds that will soon be gone leaving many unemployed. It only takes a couple years of living in Branson Missouri that you learn to make like a squirrel and save some nuts. Jay Nixon's back in town letting an area business know that the travel industry must come closer to the communities level of ethics. Thank you Mr. Nixon. This is the second time this year a suit has been filed against an entity in the Travel Club/Timeshare industry. The Branson Landing announced new leadership and Rockaway Beach is speaking out before what appears to be a cold winter. The Christmas lights are just as bright and we'll all be having a little more time with family.